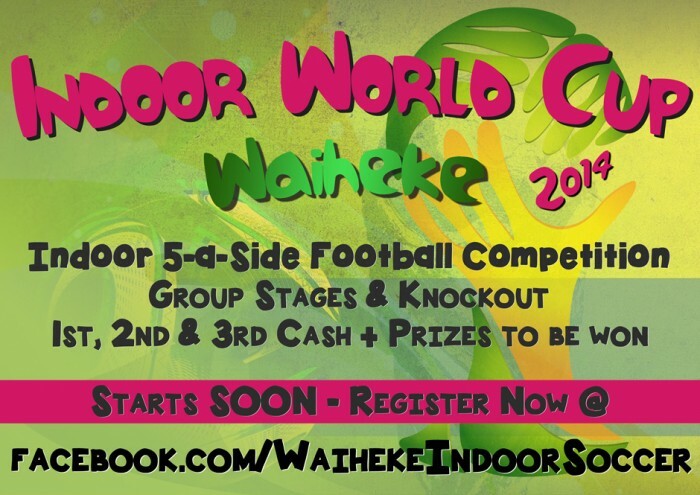 With the world’s focus squarely on Brazil for the current FIFA 2012 World Cup, Indoor Football organiser Sol Harris has come up with a neat idea for the Waiheke contingent – a mini Indoor World Cup to be held at the Waiheke Rec Centre! The event will be run over 3 nights starting Thursday July 24th 2014 and will run on a qualification and knock out basis – similar to the way the World Cup runs. There will be cash prizes for the 1st, 2nd and 3rd placed teams, along with sponsors prizes. Entry is open to anyone over the age of 16. Teams of 5 – 7 players can register as a team. Individuals or groups of less than 5 people can also register and will be helped to form a team with others.